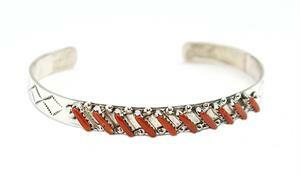 Sterling silver bracelet with 10 coral needlepoint stones set at a slant. It measues just over 1/4" wide and has some stamping on the shank, but not all the way to the ends. It is Zuni hand made by Albert Peywa.